Big series against North Carolina next weekend. Despite a steady and consistent rise from unranked in the preseason to a top 5 team, the Beavers have RPI issues that may result in them being left out of the National Seed party. Washington should have been an easy sweep. The Gamecocks improve their resume by beating the same Arkansas team that beat Florida last weekend. Strongest series win of the year for the Gators over Vanderbilt. Vanderbilt has now lost series’ to both South Carolina and Florida. Longhorns will finish up against Texas A&M next weekend. With a strong RPI, FSU looks like a safe bet top be a top 8 seed, but the series against Clemson next weekend is huge. Would love see Texas RHP Taylor Jungmann face A&M RHP John Stillson next weekend. Noe Ramirez out dueled Dirtbag ace Andrew Gagnon on Friday. The best pitcher the Jackets have had down the stretch is not All American candidate Mark Pope or first round pick Jed Bradley. It’s been So. RHP Buck Farmer. With Matt Purke already out, the Horned Frogs held out Kyle Winkler this weekend to ensure he’s strong for the post season. Sun Devils will finish up with Washington then UCLA. Sooners have gotten hot at the right time, winning 9 in a row as they head to Baylor next weekend. Clemson will finish up the regular season at #7 Florida State next weekend. Huge matchup against #1 Virginia next weekend. Matt Barnes is now 10-3 as he prepares for the draft where he should come off the board in the first round. Golden Eagles will face Rice next weekend to decide the conference. The Hurricanes can hang their hat on the fact that they beat Danny Hultzen on Friday. Owls have been in and out of the top 25 a few times this season and but yet another conference title is in reach and a strong RPI. Cal will finish up with a tough task of facing UCLA and Stanford. Trevor Bauer has now tossed 6 straight complete games! Cowboys will close out the regular season against Texas Tech. The matchup with #22 Stanford next weekend will shed some light on the Wildcat’s post season’s chances. #19 California and #5 Oregon State were rained out on friday so they played two yesterday where they split. The Beavers took the first game 3-0 behind a strong performance by Sam Gaviglio. Cal evened up the series with a 6-2 win thanks to a complete game by 2012 draft prospect LHP Justin Jones. Purkeless #10 TCU evened up the series against #18 Oklahoma State with a 10-3 victory. Trevor Bauer – RHP – UCLA – Jr. 9IP 4H 1ER 3BB 12K. (W, 9-2). 5 straight complete games for Bauer. 5! Justin Jones – LHP – California – So. 9IP 6H 2ER 0BB 8K. (W, 6-4). Josh Osich – LHP – Oregon State – Jr. 6IP 6H 4ER 2BB 4K. (L, 6-2). Jack Armstrong – RHP – Vanderbilt – Jr. .1IP 2ER 4BB 0K. 4BB in .1 IP? Really!?! Karsten Whitson – RHP – Florida – Fr. 5.2IP 6H 3ER 0BB 6K. Kent Emanuel – LHP – North Carolina – Fr. 6.2IP 7H 3ER 2BB 4K. Brian Dupra – RHP – Notre Dame – Jr. 6IP 9H 3ER 1BB 4K. #19 California @ #5 Oregon State – Postponed. #18 Oklahoma State 6 v. #10 TCU 2 – Box. Gerrit Cole – RHP – UCLA – Jr. 7.1IP 6H 1ER 1BB 5K. (W, 5-5). Cole, a top 3 pick next month outdueled Oregon’s Tyler Anderson who may be a 1st round pick in his own right. Mark Appel – RHP – Stanford – So. 8IP 6H 1ER 2BB 9K. (W, 4-5). Scott McGough – RHP – Oregon – Jr. 3IP 4H 3ER 1BB 1K. DJ Baxendale – RHP – Arkansas – So. 9IP 7H 2ER 1BB 7K. (W, 7-1). THURSDAY. Baxendale will be one of the nations premiere Friday starters next season. Sonny Gray – RHP – Vanderbilt – Jr. 8IP 4H 2ER 0BB 9K. (L, 9-3) Sonny will go in the top 10 but he was out pitched by fellow first rounder Alex Meyer. Alex Meyer – RHP – Kentucky – Jr. 9IP 5H 0ER 1BB 5K. This was Meyer’s signature college moment as he finally delivers on the promise he showed in High School. Michael Wacha – RHP – Texas A&M – So. 5IP 9H 4ER 1BB 6K. Sean Gilmartin – LHP – Florida State – Jr. 7IP 3H 0ER 1BB 11K. (W, 8-1). 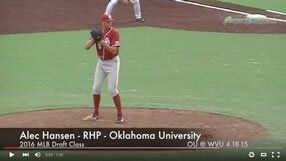 Kyle Hansen – RHP – St. John’s – So. 8IP 5H 1ER 2BB 11K. (W, 7-4). Kyle Winkler – RHP – TCU – Jr. 6IP 9H 3ER 0BB 9K. (L, 8-2). Todd McInnis – RHP – Southern Miss – Sr. 6IP 8H 1ER 1BB 4K. (W, 7-1). Conrad Flynn – RHP – Tulane – Sr. 9IP 3H 1ER 2BB 5K. Andrew Gagnon – RHP – Long Beach State – Jr. 6.2IP 9H 5ER 3BB 2K. (L, 4-7) Rough outing against Arizona State. It’s been over two months since my last mock draft, and I’m thrilled to say that the wait is over folks! With each edition we’re becoming slightly less and less inaccurate but this list is still ripe with speculation and postulation. The most significant contrast you’ll notice from other editions is that TCU LHP Matt Purke has gone from a projected #2 overall selection when this list was first published in January, to off the board completely. Purke missed time early in the season with blister issues and hasn’t resembled the pitcher that went 16-0 as a freshman last season. He’s currently shut down with shoulder soreness and that injury combined with his increased leverage of being a sophomore currently make him too risky to be classified as a first round pick. Note that a return to the mound could vault him back into the middle of the first round very quickly. 1. Pittsburgh Pirates – Anthony Rendon – 3B – Rice. Bats: R Throws: R. 6’0″ 190. Last Drafted: Atlanta Braves – ’08 (27th Round). Update: The most feared amateur hitter in the nation has just 4 HR on the year but without much protection in the Owls lineup he’s already walked 62 times, an astounding 30% of his plate appearances. A sore shoulder has limited him mostly to DH, but it’s more likely that his decreasing power numbers are a result of the new college bats and a lack of pitches to hit. 2. Seattle Mariners – Gerrit Cole – RHP – UCLA. 6’4″ 220. Last Drafted: New York Yankees – ’08 (1st Round). Update: Cole has shown improved control (not command) in 2011 and if UCLA could score more runs his Bruins would still be a top 5 team in the nation as they were in the preseason. Despite his teams inconsistent play, the Boras Corp advisee could slide past Rendon into the top spot. 3. Arizona Diamondbacks – Sonny Gray – RHP – Vanderbilt. 5’11” 180. Last Drafted: Chicago Cubs – ’08 (27th Round). Update: My hunch is that the undersized RHP will end up in the pen, but with his mid 90’s fastball and one of the better curveballs in the draft, Gray will be given every opportunity to start. 4. Baltimore Orioles – Dylan Bundy – RHP – Owasso HS (OK). 6’1″ 200. College Commitment: Texas. Update: Dylan’s brother Bobby was an 8th round pick by these Baltimore Orioles in 2008 so it’s conceivable that they make the younger Bundy the first prep pitcher off the board. Update: Missed some time with a quad injury but was triumphant in his return. On talent alone he’s a top 5 pick but bonus demand could cause him to drop to anywhere in the first round. Scouting report here by Mike Diaz. 7. Arizona Diamondbacks (for failure to sign Barret Loux) – Francisco Lindor – SS – Montverde Academy (FL). Bats: B Throws: R. 5’11” 175. College Commitment: Florida State. Update: While this draft is insanely deep, if it has a weakness it’s top tier prep position players. Lindor is impressive and the closest thing to Manny Machado in this draft. Previous Mocks: 1.17 Jackie Bradley Jr., 2.22 Jackie Bradley Jr.
Update: A workhorse who routinely gives his Longhorn bullpen the night off, Jungmann is now 10-0 with an 0.90 ERA with three complete game shutouts. The Indians have spent 1st round picks on North Carolina’s Alex White, and Mississippi’s Drew Pomeranz both of whom, like Jungmann, were among the best college arms in their respective classes. 9. Chicago Cubs – Taylor Guerrieri – RHP – Spring Valley HS (SC). 6’3″ 180. College Commitment: South Carolina. Update: Guerrieri has rocketed up draft boards after hitting 98 mph this spring. 10. San Diego Padres (for failure to sign Karsten Whitson) – Trevor Bauer – RHP – UCLA. 6’1″ 175. Last Drafted: Never. Update: Trevor Bauer has outpitched higher profile teammate Gerrit Cole and is 8-1 1.42 with 142 Ks in 91.2 IP. All this after leading the NCAA in strikeouts 2010 (165 in 131.1 IP). 11. Houston Astros – Archie Bradley – RHP – Broken Arrow HS (OK). 6’4″ 210. College Commitment: Oklahoma. Update: Like Starling, Archie Bradley is a star in both the gridiron and the diamond providing him leverage not afforded to his peers, but MLB teams will have the luxury of spreading his bonus over multiple years to buy him away from his college commitment. 12. Milwaukee Brewers – Jed Bradley – LHP – Georgia Tech. 6’3″ 205. Last Drafted: Never. Update: Now that I’ve had the chance to see Bradley throw on film a few times, I’m even more impressed with his stuff. Though he lacks polish and command, so does Gerrit Cole, the top pitcher in this class. Update: The athletic outfielder is leading the Huskies in AVE (.371), HR (9), RBI (62) and SB (22) among other things. 14. Florida Marlins – Daniel Norris – LHP – Science Hill HS (TN). 6’3″ 180. College Commitment: Clemson. Update: Appears to be falling on the list of prep pitchers but it’s more the result of risers like Bundy and Guerrieri. Norris is a classically trained pianist and one of the more grounded kids in this draft. 15. Milwaukee Brewers (for failure to sign Dylan Covey) – Matt Barnes – RHP – Connecticut. 6’3″ 180. Last Drafted: Never. Update: I’m trying not to add too much weight to signability this far out from draft day, but the financial state of the Dodgers means they most likely won’t select a high schooler. 17. Los Angeles Angels – Blake Swihart – C – Cleveland HS (NM). Bats: B Throws: R. 6’0″ 175. College Commitment: Texas. Update: One of the best prep bats in this class, Swihart is a switch hitter who has a better than average chance to remain behind the dish. There’s a lot to like about that last sentence. 18. Oakland Athletics – Mikie Mahtook – OF – LSU. 6’1″ 205. Bats: R Throws: R. Last Drafted: Florida Marlins ’08 (39th Round). Update: Mikie Mahtook has been on the national scene since his freshman year when he stared on a National Championship team and this year he’s taken the next step to superstardom. 19. Boston Red Sox (from Tigers for Victor Martinez) – Alex Meyer – RHP – Kentucky. 6’9″ 210. Last Drafted: Boston Red Sox. ’08 (20th Round). Update: Scouting Report Here. The Red Sox aggressively tried to sign him away from his Kentucky commitment so it’s conceivable Meyer comes off the board here. 20. Colorado Rockies – Dillon Howard – RHP – Searcy HS (AR). 6’2″ 200. College Commitment: Arkansas. Update: Howard has three potential plus pitches with his change-up being his best offering. 21. Toronto Blue Jays – Tyler Anderson – LHP – Oregon. 6’3″ 195. Last Drafted: Never. Update: Though the Ducks season has been a bit of a disappointment, Anderson has thrived going 6-1 with a 1.51 ERA and 92 K’s in 83.1 IP. Update: Bradley Jr. entered the season on the heals of a Most Outstanding Player award in the College World Series as a potential top 5 pick. He’s had some trouble adjusting to the new bats and will now miss significant time (if not the season) with a torn ligament in his wrist. 23. Washington Nationals (from White Sox for Adam Dunn) – Josh Bell – OF – Jesuit Prep School of Dallas (TX). Bats: B Throws: R. 6’3″ 205. College Commitment: Texas. Update: Like Swilhart, Bell is a switch hitter and one of the top prep bats in this class. 24. Tampa Bay Rays (from Red Sox for Carl Crawford) – Henry Owens – LHP – Edison HS Huntington Beach (CA). 6’5″ 185. College Commitment: Miami (FL). Update: Owens may pass Norris as the top prep lefty in this draft. 25. San Diego Padres – Andrew Susac – C – Oregon State. 6’1″ 205. Bats: R Throws: R. Last Drafted: Philadelphia Phillies – ’09 (16th Round). Update: Susac is currently out with a broken hamate bone, but he’ll return in time for the Beavers run at a return to Omaha. 26. Boston Red Sox (from Rangers for Adrian Beltre) – Jose Fernandez – RHP – Alonso HS (FL). 6’3″ 215. College Commitment: South Florida. Update: The Cuban born Fernandez has a plus fastball that sits in the mid to low 90s. 27. Cincinnati Reds – Levi Michael – SS – North Carolina. 5’10” 180. Bats: B Throws: R. Last Drafted: Never. Update: Michael graduated from HS a semester early and started as a freshman in what would have been his senior year of high school. He’s spent seasons at 2B and 3B before settling at SS this year where he’s holding his own. 28. Atlanta Braves – Brian Goodwin – OF – Miami Dade JC. 6’1″ 190. Bats: L Thorws: R. Last Drafted – Chicago White Sox – ’09 (17th Round). Update: A bluechip recruit at North Carolina, Goodwin left after his freshman year rather than ride out a suspension resulting in his being draft eligible a year earlier. 29. San Francisco Giants – Jason Esposito – SS/3B – Vanderbilt. Throws: R Bats: R. 6’1″ 195. Last Drafted: Kansas City Royals – ’08 (7th Round). Update: Esposito is a slick fielding 3B with decent pop on one of the Nation’s best NCAA teams. 30. Minnesota Twins – Nicky Delmonico – C/3B – Farragut HS (TN). 6’2″ 185. Bats: L Throws: R. College Commitment: Georgia. Update: Farragut is a powerhouse in Tennessee baseball with a number of MLB draft picks and Delmonico could go down as the greatest in school history. The Twins actually selected Farragut pitcher Kyle Waldrop in the 1st round of the 2004 draft. 31. Tampa Bay Rays – (From Yankees for Raphael Soriano) – Brandon Nimmo – OF – Cheyenne (WY). 6’3″ 185. Bats: L Throws: R. College Commitment: Arkansas. Update: Nimmo looks to become the best MLB draftee since John Buck. 32. Tampa Bay Rays – John Stilson – RHP – Texas A&M. 6’4″ 190. Last Drafted: Minnesota Twins – ’09 (19th Round). Update: One of the Nation’s best closers as a sophomore, Stilson has transitioned into the Friday starter role and owns a 4-1 record with a 1.71 ERA and 87 K’s in 79 IP. 33. Texas Rangers (From Phillies for Cliff Lee) – Charlie Tilson – OF – New Trier HS (IL). 6’0″ 165. Throws: R Bats: R. College Commitment: Illinois. Update: An extended winter has limited the opportunities of MLB teams to get looks at Tilson, but he’s one of the more athletic outfielders in this draft. Period. Matt Purke – LHP – TCU. 6’4″ 180. Last Drafted: Texas Rangers – ’09 (1st Round). Kolten Wong – 2B – Hawaii. Bats: L Throws: R. 5’8″ 175. Last Drafted: Minnesota Twins – ’08 (16th Round). Alex Dickerson – OF – Indiana. 6’3″ 220. Throws: L Bats: L. Last Drafted – Washington Nationals ’08 (48th Round). Zach Cone – OF – Georgia. 6’2″ 200. Throws: R Bats: R. Last Drafted – Los Angeles Angles ’08 (3rd Round). For the second straight week, there is no movement in our top 5 as each of those teams won their series, including sweeps from our three SEC top 5 teams. The cream of the college crop is becoming abundantly clear as the top 5 teams listed below continue to separate themselves from the mediocre and inconsistent middle of the pack. The Gamecocks rolled through Auburn this weekend and will travel to Mississippi next weekend. It’s hard to believe that the same Virginia team that won 17-0 on Friday, lost 5-4 on Saturday. But at 42-5, I won’t hold it against them. After scoring 31 runs last weekend against LSU, the Dores outscored state rival Tennessee 39-5. The Gators will travel to Arkansas and will be on ESPN U on both Thursday and Saturday. Josh Osich no hit the Bruins on Saturday beating an impressive Trevor Bauer. Friday’s win against then #14 Oklahoma was Augie Garrido’s 1800th of his career. Sophomore Jake Barrett has flourished in the Sunday role after faltering on Fridays earlier in the year. Then #21 Miami was one of the hotter teams in college baseball before running into the Seminoles. An ugly 1-3 week would have knocked the Aggies down even further if Georgia Tech, Fresno St. and Cal State Fullerton had performed better. 0-1 @ Dallas Baptist, 0-1 v. Oklahoma, 2-0 v. BYU. Don’t look now but TCU, our preseason #2 team, is now back in the top 10 after stumbling out of the gate. They’ll have a tough challenge in Oklahoma State next weekend. Why didn’t Noe Ramirez pitch this weekend? Comments welcome. East Carolina is a fringe top 25 team in their own right, thus the Golden Eagles series victory is all that more impressive. Rough week for the Jackets but note that Clemson was my preseason #6 team. Game 4 of the Hawaii series to take place tomorrow. Not going to drop them too much after going a combined 2-2 on the road against the #6 and #10 teams in the nation respectively. Tar Heals took the weekend off for Finals. Nice bounce back after being swept by Texas A&M last weekend. Again a nice bounce back after a sweep (Arizona State) but the Bears will have their hands full with #5 Oregon State next weekend. Trevor Bauer improved on his impressive numbers but both he and Gerrit Cole lost. A tough weekend behind them, the Canes will get a tune up against Hofstra next weekend before traveling to Virginia the next. Stanford will need to finish strong with remaining series against Oregon, Arizona and Cal to avoid a disappointing season. Nice rebound after losing 2 of 3 to Oregon last weekend. Clemson was my preseason #6. UConn checked in at #10 in my preseason Top 25 but fell off early after a horrible first month. #5 Oregon State took game two and the series on the road against #18 UCLA behind a no hitter by rising draft prospect Josh Osich 2-0. #8 Texas secured a series win against #14 Oklahoma with a 4-3 win behind a strong performance by Senior Cole Green. #9 Florida State takes game two and the series 2-0 against #21 Miami. #17 Stanford evened up the series @ #7 Arizona State with a 6-4 win. Trevor Bauer – RHP – UCLA – Jr. 9IP 4H 2ER 2BB 15K. (L, 8-2). 142 K’s now for the nation’s leader in 91.2IP. Austin Wood – RHP – USC – Jr. 3IP 6H 7ER 4BB 1K. (L, 4-6). Wood was horrible in a game that USC would end up losing 20-4. Josh Osich – LHP – Oregon State – Jr. 9IP 0H 0ER 1BB 13K. (W, 6-1) No hitter against UCLA. Jack Armstron – RHP – Vanderbilt – Jr. 2IP 1H 0ER 1BB 1K. Hoby Milner – LHP – Texas – So. 2IP 1H 0ER 0BB 1K. Michael Wacha – RHP – Texas A&M – So. 5.2IP 8H 4ER 2BB 6K. 5 unearned runs were his undoing. Jed Bradley – LHP – Georgia Tech – Jr. 9IP 7H 0ER 1BB 3K. (W, 5-2) Quality win against a resurgent Clemson team. Tyler Wilson – RHP – Virginia – Sr. 5.1IP 6H 4ER 1BB 6K.